The LORD spoke to Moses: 2 See, I have called by name Bezalel son of Uri son of Hur, of the tribe of Judah: 3 and I have filled him with divine spirit,1 with ability, intelligence, and knowledge in every kind of craft, 4 to devise artistic designs, to work in gold, silver, and bronze,5 in cutting stones for setting, and in carving wood, in every kind of craft. 6 Moreover, I have appointed with him Oholiab son of Ahisamach, of the tribe of Dan; and I have given skill to all the skillful, so that they may make all that I have commanded you: 7 the tent of meeting, and the ark of the covenant,1 and the mercy seat2 that is on it, and all the furnishings of the tent, 8 the table and its utensils, and the pure lampstand with all its utensils, and the altar of incense, 9 and the altar of burnt offering with all its utensils, and the basin with its stand, 10 and the finely worked vestments, the holy vestments for the priest Aaron and the vestments of his sons, for their service as priests, 11 and the anointing oil and the fragrant incense for the holy place. They shall do just as I have commanded you. The appointment of Bezalel and Oholiab along with the rest of the divinely inspired artisans presents an opportunity to expand the role of the called people of God beyond prophets and priests. Bezalel coming out of the tribe of Judah and Oholiab coming out of the tribe of Dan expands the group of people upon which the divine spirit rests. The work of constructing a tabernacle or a church is the work of the people, not just the work of the priests and pastors. There is within the calling of these artisans a recognition that the accomplishment of the divine vision involves the various gifts of the priest, the prophet, the artisan and the worker. Each person has a part to play in the unfolding of God’s purpose for God’s people. Martin Luther expanded upon this in his belief that every Christian had a vocation or multiple vocations, areas where their skills were used to serve God. Each person, whether a mother, a farmer, a shoemaker, a pastor, or a prince all had a role to play and gifts to serve God’s kingdom. St. Paul could refer to many gifts coming from the one Spirit of God (both Romans 12 and 1 Corinthians 12) and that all the gifts of the community of faith where for the work of God in the church. God has spread the gifts among God’s people and not solely in the hands of the ordained ministers of the church. One of the peculiarities of the next chapter is that when Aaron the priest becomes the artisan everything comes out wrong. I’ve mentioned a couple times in this section that my congregation is going through a building expansion as I write this and I’ve gotten to see firsthand the skilled work of the artisans who are working on the building. I have some skill with my hands, but it is not my primary gift. Yet, the crew who is working in concrete, steel, sheetrock and paint (not to mention plumbing, electrical wires and the like) have gifts and skills I do not. I could learn those skills given time, but that is not my vocation or my position. I am able to delight in the work that God is able to do through these artisans and at the same time celebrate the work that God has equipped me to do. I had the opportunity over the weekend to travel with my wife to see some of the areas she grew up, and one of the gifts of the weekend was sitting on a deck in some cooler weather than we are currently experiencing in Texas and just to look out over the terrain and be. My wife and I both work jobs that can consume a lot of our life and time and it was good to have some time to just be together and to rest. This is what sabbath is about. It is about resting and it is a deadly serious proposition for the people. The sabbath gets its own commandment in Exodus 20, is mentioned again Exodus 23: 12-13 and then again is brought up here. Even prior to the construction of the tabernacle after the incident of the golden calf the sabbath will again be highlighted at the beginning of Exodus 35. The sabbath for the covenant people is highlighted as a matter of life and death. Sabbath is a day where there is no buying or selling, where work is prohibited and people are forced to rest and sit. In our frenetic society this may be the most difficult commandment to live into. In a society where the blue laws that forced businesses to be closed on Sundays it may have been easier since there were few options on Sundays. Yet, that is not our time and there is no easy going back to a past that may or may not have existed like we imagine. For now, the wisdom of sabbath may be learning that it is a matter of life and death in our culture to stop and reflect on the value of things we have rather than the price of the things we can accumulate. Within the Hebrew Scriptures there is a call to learn patience that moves against our own sense of immediate need. The people in the wilderness would call upon Moses every time there didn’t seem to be enough food or water immediately and threaten to return to Egypt. While Moses is up on the mountain the people will come to Aaron and ask him to craft their gods for them. The LORD expects the people to stop and wait at times and lingers with them in the wilderness while the details are handed on. The sabbath also expect the people to learn the value of waiting, or resting and of valuing the things that have been provided rather than straining towards the things they can acquire. 18 When God1 finished speaking with Moses on Mount Sinai, he gave him the two tablets of the covenant,2 tablets of stone, written with the finger of God. 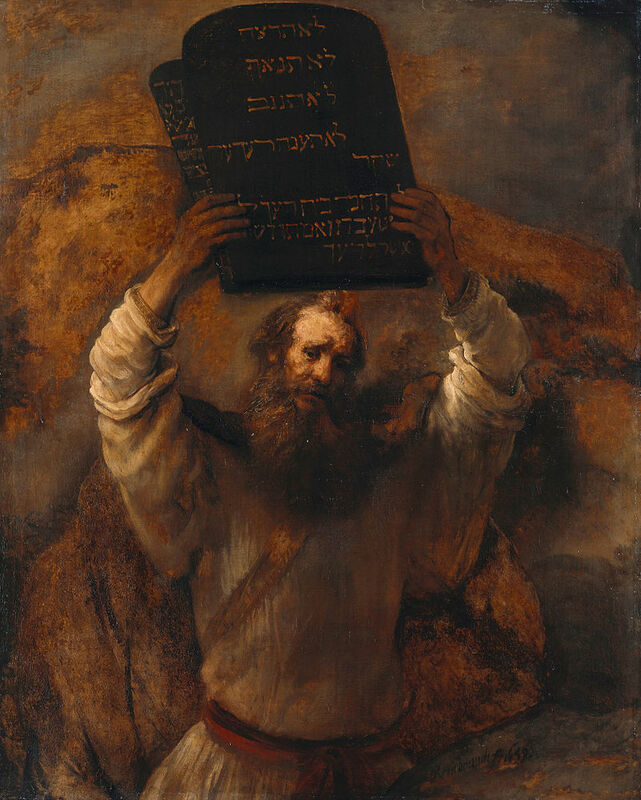 The infamous stone tablets are finally given to Moses as the scene transitions from Moses’ time with God on Mount Sinai to Aaron’s struggles with the people in the valley. Moses listens, the people demand. God departs the plan for the tabernacle where God can dwell among the people, Aaron crafts golden calves as poor substitution for an imageless God of Israel. God’s vision is one of order in contrast to the disorder Moses will find when he descends the mountain. The covenant will be broken and remade but it remains the word of God that is to be brought to God’s people. This entry was posted in Biblical Reflections, Exodus and tagged Bezalel, Exodus, Exodus 31, Law, Moses, Oholiab, Sabbath, Tabernacle, Vocation. Bookmark the permalink.